Over 250 seventh and eighth grade students from Cambridge schools filled Johnson Athletic Center Wednesday to present their science projects at the 2001 MIT/Cambridge Science Expo. Research was designed to be a very large part of each project. “We read a lot of books about sources of water to see how they each vary,” said Carrie Simcoe, who teamed with classmate Gina Gentille to examine what various water sources in Cambridge did to plants. MIT students helped out at the events by walking around and listening to the participants present their projects. The MIT students did not actually judge the presentations but rather discussed their own scientific knowledge with the participants to promote their interest in the sciences. Other MIT students took the participants on tours of various campus locations, such as the nuclear reactor, the wind tunnel, and the Edgerton Center. “Most of the [MIT] students evaluate the projects, talk to the kids, and give them stickers. A few regular volunteers were school representatives who stuck around and helped out the Cambridge school teachers,” said Geeta Nagpal ’02, who helped to organize the event along with Greg C. Townsend ’02, and Project Coordinator of the MIT Public Service Center Heather Trickett. The expo is one of many outreach programs organized by the Public Service Center. Expo speakers included Cambridge Mayor Anthony D. Galluccio, Superintendent of Cambridge Schools Bobbie D’Alessandro, and Co-Director of the MIT Office of Government and Community Relations Paul Parravano. The closing ceremony’s performers, Groove Phi Groove members Kenroy Cayetano G and Ngozika Nwaneri ’01, were well received by the audience. As a token of thanks, all teachers and speakers were given a sunflower at the end of the ceremony. MIT Principal Research Engineer Dave M. Otten demonstrated to the participants the Micromouse Robots he had created for competitions. One of the robots found the quickest way around a course, and another “firefighter robot” pyro-electrically sensed a fire’s location and extinguished the blaze with a fan. The participants were given a good deal of freedom to experiment and research what they wanted to for their projects. Topics included the physics of baseball, holography, materials science, the social behavior of dogs versus humans, and environmental science. There was one project that set out to answer the age old “How many licks does it take to get to the center of a Tootsie pop?” by analyzing the chemical reaction of saliva with the candy and the force of the tongue. Benjamin Miller of Longfellow Middle School was very interested in how wings made things fly. “After I talked about a few ideas with my dad, I decided I would analyze airfoils and how their shape affected the amount of lift and drag it created,” he said. In order to do this, Miller constructed his own wind tunnel out of wood, plexiglass, and a leaf blower. He cut the airfoils using a bezzier tool at his school and measured the amount of washers that each airfoil could lift in the tunnel. Using a mechanical engineer’s handbook, he derived the lift and drag the airfoil created. “I concluded that since my wind tunnel went at a very low speed, which means that most of the force created is lift, the larger, fatter airfoils would work the best for these speeds,” Benjamin concluded. He was also able to explain what the four coefficients in the NACA airfoil coding system meant, a feat that only some Course XVI majors can duplicate. Lucas Riley from the Cambridgeport School heard from The Belmont Habitat Wildlife Sanctuary and Education Center that they had begun to have a problem with an infestation of adelgids, an insect from Japan. Rising to the occasion, Riley examined a plot of hemlock trees and monitored their population. “They were very hard to see ... usually only their egg cases can be noticed,” said Lucas, describing how he went about examining the area of trees. “I eventually noticed that with each tree the adelgids would migrate to the top and remain there,” he said. Rocket enthusiasts Teddy Applebaum and Bjorn Maybury-Lewis from the Agassiz school wanted to figure out what the best air-to-water ratio was for a hydro-rocket. They designed a video detailing each experiment and explaining how a hydro-rocket works and why more water turned out to be better for the rockets. 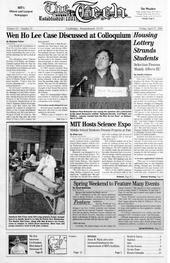 The first Science Expo was organized by the Educational Studies Program in the spring of 1993. Since then, it has been run annually by the Public Service Center and its staff of MIT students. This year’s event was co-sponsored by the MIT Public Service Center and the Cambridge Public Schools.